When it comes to your oral health and appearance, a smile design that’s based on your needs and your desires is the best investment you can make. A smile makeover cost from a dentist open Saturday varies depending on the amount of work you have performed. You can draw out the makeover or have it done in one fell swoop when you visit a top Yonkers dentist. Getting a smile makeover involves using various cosmetic dentistry procedures to achieve a new and improved look. It doesn’t matter what condition your teeth are in if you’re seeking a smile makeover, but the underlying base must be healthy. And because the best dentist in the Yonkers is also extensively experienced in general dentistry, he can ensure that you don’t have gum disease or other condition that could be harmful to your oral health before offering you smile makeover procedures. Your family dentist who specializes in smile design offers everything from fixing gaps in your teeth, thanks to implants, to simply brightening your smile with the latest whitening treatment. Smile makeover costs can sometimes be negotiated with a top Yonkers dentist when a procedure isn’t covered by your insurance; and you usually can find a payment plan that works for you. Invisalign, also known as invisible braces, help you achieve straight teeth. They maintain your look of a metal-free mouth, without the appearance of normal braces. Invisalign braces are made especially for you by creating a unique mold of your mouth. Bonding repairs teeth that are discolored, chipped, cracked or broken. Bridges can fill in areas of your mouth where some teeth are missing. Porcelain crowns fix teeth that are partially broken, and realistically give the appearance of a regular tooth. Whitening can be applied no matter how discolored your teeth are, even if they need minor stain lifting. Implants are fake teeth held in by a screw, and are virtually indistinguishable from your normal teeth. A full set of implants, All-on-4, are also possible. 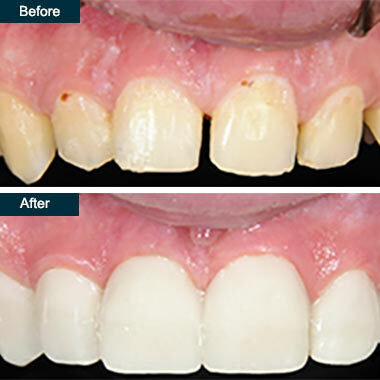 When planning a new smile design, the procedure is as unique as you are. In some cases, you might need to have only one or two things done, such as teeth cleaning and whitening. You may discover that you need extensive work done in order to achieve your dream smile, such as when you have extensive tooth decay or periodontitis. In that case, you may have to come back for several appointments to complete each procedure and give your mouth time to heal completely. Your Sunday dentist evaluates your smile to find out what changes are important to you. He can also make recommendations if something is medically necessary, such as removing a bad tooth and replacing it with an implant or building up your gums with a bone graft before inserting implants. It’s easy to be dissatisfied with your smile, but a top Yonkers dentist open on Saturday can help you achieve the look you’re seeking. He can suggest a variety of treatments that offer the most benefits and make the most noticeable difference. Because each person has unique needs, a smile makeover cost can vary based on individual. Having smile makeover therapy is not a one-size-fits-all process. It can take weeks or months to create a smile design that solves your all your dental problems and gives you the desired look. Some treatments are done in less than a day, such as a whitening treatment. You can make an appointment to see a dentist open on Saturday, and have it taken care of right away. Getting fitted for a crown might take a couple of visits, first to get a mold of the tooth and then to have it put on. In cases such as implants or any procedure where pain is involved, the best dentist in Yonkers provides pain relief in the form of local anesthesia. If you feel you’d benefit from another option, you can talk to your Yonkers dentist about more extensive anesthesia. Some treatments like teeth whitening cause very little sensitivity. Your treatment and aftercare are determined by the specific procedures you have done. Although you may feel some discomfort at first as the pain medication wears off after extensive dental work, you should feel like yourself again soon. Your dentist can send you home with a prescription if he believes you need extra pain relief. Depending on the treatment chosen, your teeth can feel sore or sensitive, but it should wear off after a few days. Planning a smile makeover provides you with a new look. If you want to see a brand-new smile, visit your top Yonkers dentist today to discuss what options are available to you. Your smile makeover cost varies depending on the amount of work you elect, but you can always be assured that the best dentist in Yonkers will give you a smile design you can take to the bank! Do you have any questions about the Smile Makeover procedure in Yonkers, Westchester NY? Would you like to schedule an appointment with the best Yonkers cosmetic dentists? Please contact our dental clinic for consultation.